Article 67(1) of the Treaty on the Functioning of the European Union provides for the constitution of an area of freedom, security and justice with respect for fundamental rights and the different legal systems and traditions of the Member States. A European area of freedom, security and justice in which judicial cooperation can take place requires not only knowledge of European law, but in particular mutual knowledge of the legal systems of other Member States, including national legislation. The e-Law formation of the Working Party on e-Law is competent in matters of developments regarding the legal databases and information systems managed by the Publications Office of the European Union (1). The EUR-Lex and N-Lex portals should fulfil the objective of providing access to information about the EU and Member States’ legal systems and should serve as a useful tool for citizens, legal professionals as well as Member States’ authorities. Knowledge on the substance and application of European Union law cannot be solely acquired from EU legal sources, but also from national sources, in particular from national legislation implementing European Union law. The process of cooperation within the European Union has increased the need to identify and exchange legal information originating from regional and national authorities at the European level. This need is partially met by digitally available legal information and the widespread use of the internet. However, the exchange of legal information is greatly limited by the differences that exist in the various national legal systems, as well as the differences in their technical systems used to store and display legislation through their respective websites. This hampers the interoperability between the information systems of national and European institutions, despite the increased availability of documents in electronic format. The use of ELI could help overcoming these problems. Using unique identifiers and structured metadata in referencing national legislation in Official Journals and Legal Gazettes, if Member States so decide, would allow effective, user-friendly and faster search and exchange of information, as well as efficient search mechanisms for legislators, judges, legal professionals and citizens. In line with the principle of proportionality and the principle of decentralisation, each Member State should continue to operate its own national Official Journals and Legal Gazettes in the way they prefer. However, in order to facilitate the further development of interlinked national legislations and to serve legal professionals and citizens in their use of these databases, a common system for the identification of legislation and its metadata is regarded as useful. Such a common standard is compatible with the principles outlined in the previous paragraph. For the identification of legislation, a unique identifier should be used which is recognizable, readable and understandable by both humans and computers, and which is compatible with existing technological standards. In addition, ELI proposes a set of metadata elements to describe legislation in compliance with a recommended ontology. The European Legislation Identifier (ELI) should guarantee a cost-effective public access to reliable and up-to-date legislation. Benefiting from the emerging architecture of the semantic web, which enables information to be directly processed by computers and humans alike, ELI would allow a greater and faster exchange of data by enabling an automatic and efficient exchange of information. ELI should give the Member States and the European Union a flexible, self-documenting, consistent and unique way to reference legislation across different legal systems. ELI URIs uniquely identify in a stable way each legislative act across the European Union, while at the same time taking into account the specificities of national legal systems. ELI takes into account not only the complexity and specificity of regional, national and European legislative systems, but also changes in legal resources (e.g. consolidations, repealed acts etc.). It is designed to work seamlessly on top of existing systems using structured data and can be taken forward by Member States at their own pace. The European Case Law Identifier (ECLI) (2), applicable on a voluntary basis, already provides a European system for the identification of case-law. ELI identifies legislative texts which have different and more complex characteristics, and the two systems are complementary. The Council welcomes the initiative of a number of Member States to develop, on a voluntary basis at the national level, the European Legislation Identifier (hereinafter referred to as ELI). discuss each year in the Council Working Party on the progress made with the introduction of ELI and metadata for national legislation. The Publications Office of the European Union could host and maintain on its EUR-Lex portal the register of formal descriptions of Member States’ URI schemes, the referenced authority tables together with the ELI ontology, as well as useful information. Apart from Member States, candidate countries and Lugano States (4) and others are encouraged to use the ELI-system. (2) The Council invited the introduction of the European Case Law Identifier and a minimum set of uniform metadata for case-law by way of conclusions (OJ C 127, 29.4.2011, p. 1). (3) OJ L 168, 30.6.2009, p. 41. (4) Iceland, Norway and Switzerland. The following elements of ELI address these requirements on a technical basis. These components can be implemented independently of each other, but the combination of all of them will give the full benefits of ELI. ELI uses ‘HTTP URIs’ to specifically identify all online legal information officially published across Europe. These URIs are formally described by machine-readable URI templates (IETF RFC 6570), using components that carry semantics both from a legal and an end-user point of view. Each Member State will build its own, self-describing URIs using the described components as well as taking into account their specific language requirements. While a structured URI can already identify acts using a set of defined components, the attribution of additional metadata established in the framework of a shared syntax will set the basis to promote interchange and enhance interoperability between legal information systems. By identifying the metadata describing the essential characteristics of a resource, Member States will be able to reuse relevant information processed by others for their own needs, without having to put into place additional information systems. Therefore, while Member States are free to use their own metadata schema, they are encouraged to follow and use the ELI metadata standards with shared but extensible authority tables, which permit to meet specific requirements. 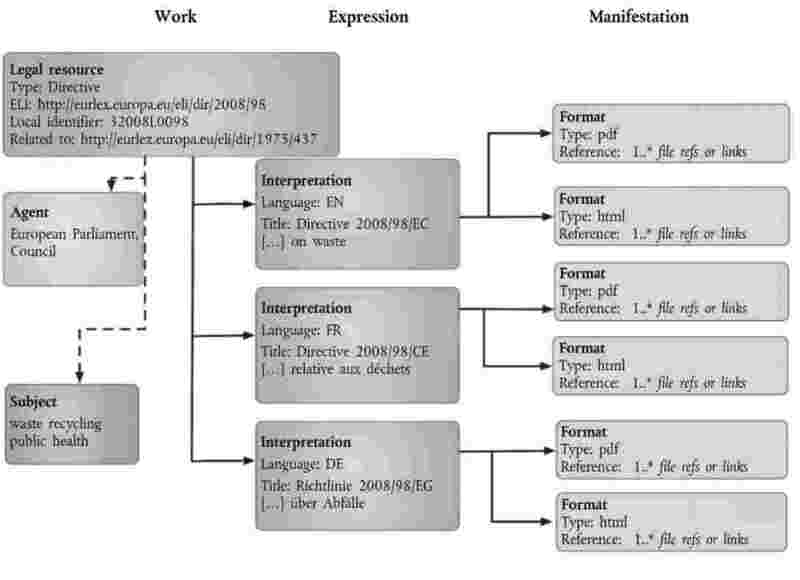 The ELI metadata schema is intended to be used in combination with customised metadata schemas. For the data exchange to become more efficient, ELI metadata elements may be serialised in compliance with the W3C Recommendation ‘RDFa in XHTML: Syntax and Processing’. Ontology is an ‘explicit, formal specification of a shared conceptualisation’ and represents a formal description of a set of concepts and the relationships in a given domain. By describing the properties of legislation and their relationships between different concepts, a shared understanding is made possible and ambiguities between terms can be avoided. Being a formal specification, it is directly machine-processable. ELI itself builds on the well-established model for ‘Functional requirements for bibliographic records’ (FRBR, http://archive.ifla.org/VII/s13/frbr/), aligned with other current standardisation initiatives in the field. FRBR distinguishes between the concepts of ‘work’ (distinct intellectual or artistic creation), ‘expression’ (the intellectual or artistic realisation of a work) and the ‘manifestation’ (the physical embodiment of an expression). Each Member State using the ELI must appoint a national ELI coordinator. One country must not have more than one ELI coordinator. sharing and disseminating information on ELI. The national ELI coordinator should provide information to be published on the ELI website, as defined in paragraph 4, information describing the way the ordinal number is composed. ELI’s implementation is of national responsibility. ELI may optionally also be used within physical manifestation of the legislative act itself, to facilitate easy referral. An ELI website should be established; this website should be part of the EUR-Lex portal. information on the national ELI coordinators: their role and responsibilities, but also contact information per country. The ELI coordinator for the EU is the Publications Office of the European Union.